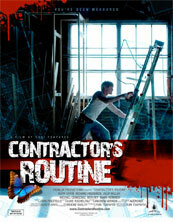 When planning out the films I was going to try and see at the 2010 Buffalo Niagara Film Festival, I noticed one on the first Saturday called Contractor’s Routine. The image on the poster was intriguing and its categorization as a psychological thriller put in firmly in my wheelhouse. I checked out the website and was met by a somewhat jumbled mess of text and images, giving me the impression that perhaps the finished film would show it’s independent budget on its sleeve. I therefore sat down for the screening with reserved expectations, hoping to at least be entertained with some Russian flavor from writer/director Yuri Tsapayev as the first non-local work of the day. Let’s just say I wasn’t prepared for the stunning work that soon unfolded. Visually gorgeous and intelligent in the pithy dialogue spoken by the complex characters involved, the work easily vaulted itself to the top of my Best of 2010 list. Whether it stays there or not remains to be seen, but as of now, there has been nothing better. Jacob is an independent contractor/carpenter that appears to live via his work; a small apartment is doubled as his studio— mattress atop his table to form a bed—looking as worn down as its resident. He is high-strung and introverted as we see him imagine a fantasy woman to make love to upon waking up in the morning. Her visage is the one bright spot in an otherwise dingy existence, not even able to brush his teeth with the sink since the urinal in the building’s bathroom is the only clean running water, you can only imagine the thoughts going on in his head. Very deliberate in his motions and actions, quietly determined on an unknown quest besides a phone call to his girlfriend, (one who’s only involvement in the relationship is to take his money—you can’t blame him for having naked dream girls in bed), home appears to be a safe haven for him; a sanctuary of silence that keeps the voices out. Once he steps away, however, the quiet breaks into a never-ending assault of philosophical rants and violent temptations. Jacob, (a tour-de-force performance from Kevin Giffin), is an odd number in this universe. Solitary and chosen to keep the balance—working to make things even—he imagines bloodied outcomes of staccato vigilantism, but keeps a cooler head in reality. His diatribes show the complexities of existence, arguing constantly with his friend, coworker, alter-ego, and literal conscience Esau, (a very funny, yet deep turn by Richard Frederick); the two weigh in on such subjects as Octo-Mom, the idea of whether she hears the call of God’s desire for procreation stronger than others or if she is a selfish woman with no regard for her children’s well-being. Jacob guesses that at least one of her fourteen kids will eventually grow up to be a criminal, a life of squalor and needing to fight for attention and health deems it a very real possibility. And then there is the subject of intent versus action. Is accidentally killing a bunch of people through unknown poisoning worse than someone planning a mass murder, but screwing it up and only killing himself? Is the intent to harm more evil than actual harm unplanned? There is definitely something to the argument and it’s one close to Jacob’s core; himself feeling guilt when treading upon a person’s essence in thought although never their body in action. The journey of the film takes us on an unknown trajectory; we watch him during what could be a normal day of supply shopping, dentist visits, and a planned evening out with his lady friend. But within these stops are glimpses of the malicious intent residing within. Esau, (a name with a deeper religious connotation in regards to Jacob), does his best to quell the flames, reminding always that “the more a soldier sleeps, the less harmful he is” or that his dreams won’t accomplish anything but trouble. Jacob’s short fuse is tested regularly—he wants nothing more than to bash a hardware store clerk’s head in with a hammer when he fails to discount items on sale; he’d choke the life out of a mother neglecting her crying baby if given the chance; and would brutally maim his dentist and priest for the sexual indiscretions they think about and possibly act on. We as viewers become complicit in these murders, not only by watching his fantasies carry them out, but also by subconsciously cheering him on, knowing that the victims deserve what’s coming. In a Fascist state like Nazi Germany, the retribution dreamed up by Jacob would be praised and encouraged. Yet through all the pent up rage, Esau always calms him to quietly go about his business, ignoring the travesties occurring. Jacob is a pushover as a result, letting everyone walk all over him; a Christ-like figure in turning the other cheek and sacrifice, but an inversed one due to his desire for punishment. Two ends of the spectrum that are equal yet completely opposite, mirrored like a 24 and a 42. It is a phrase uttered by Easu towards the middle of the film when Jacob finds a kindred spirit in a butterfly collector played by Arthur Scappaticci. Jacob bought two sets of brass numbers to repair the man’s door and, while there, notices the care and precision that went into the stranger’s butterfly displays. Here is a man that has made something beautiful out of dead things, much like his own craft at making objects from wood—a dead material that was once a living and breathing entity in its own rite. I’ll just say this about the scene: pay particular attention to the conversation held when exiting the apartment. It is dialogue thought to be unimportant at the time, but so very vital to what is happening during the entire film, hidden beneath the surface. It’s only revealed at the end during a conclusion that still brings a chill—not because of Jacob’s ‘work’, but because of how everything that came before makes sense in a completely different way as a result. I loved the script’s words for the surface quality of being intelligent and thought-provoking, much like a film such as Waking Life, but only after I experienced the end did I fully understand pieces truly fit together. Tsapayev has created something that begs for repeat viewings. I look back at scenes from memory and realize how different they all are when put in context with the ending. Contractor’s Routine is a puzzle to be solved through sights and sounds; it’s a story that never panders to its audience or believes they won’t understand. It wouldn’t surprise me at all to hear people come out of a viewing, shaking their heads and wondering what the heck happened; but that is their loss. I’d rather see a challenging work of art from an auteur that dares to be original than some piece of compromised garbage, watered-down to appease a mainstream public. Whether the words complicate or not, though, one can’t deny the aesthetic at work or the director’s eye for interesting compositions and visuals. Jacob is doing God’s bidding, he has been chosen to do what others can’t fathom or stomach. As his own judge and jury inside his mind, the real horror at hand is what happens when Esau isn’t there to keep him safe from himself. But then who’s to say God doesn’t want the vengeance and retribution? Perhaps Easu’s conscience is actually preventing Jacob from doing the work he is meant to accomplish. That’s the scariest thought of them all, if only because I can actually fathom it being a possibility. Well, thank you very much Jared. It was quite an experience being “Jacob” and a luxury working with such a talented director and fellow actors. I had just been saying to myself that it was weird being almost a third of the way through the year and still no film to give more than an 8/10 to, then CR came out of nowhere. Seriously great job. Keep up the great work. Wonderful film Yuri … deserves all the praise lauded on it. Good luck on the festival circuit.